A Rebellion producer said that he could consider updating Alien Vs. Predator to use the motion control technologies Natal or Arc when they come out this Fall. The senior producer of Alien Vs. Predator at Rebellion Studios, Dave Brickley, is interested in motion control. Even though his game doesn't come out until February 16, Brickley is already talking about updating his AvP for new technologies, such as the motion control systems from Microsoft or Sony. Back in September '09, it was announced that Sony games like Little Big Planet and the Resident Evil 5 director's cut would get updates when the company's motion control system would be released. Now that the Arc has been delayed until the Fall, Sony may be trying to get more games and publishers to follow suit. 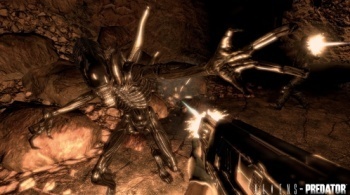 When asked whether AvP was one of those games and if it could be updated to use the motion control system, Brickley said, "Yeah, it certainly could." "Like any gamer I'm excited about the prospect of adding a new dimension to the medium. The Wii showed it can add something totally different that's not just tacked on," he said. "What do you think, would people like to actually rip out someone's spine with their bare hands?"